On a glorious afternoon Old Otliensians travelled to Stocksbridge for their opening league fixture of the 2017-2018 season. The conditions were perfect for free flowing rugby and provided an ideal opportunity for the visitors to demonstrate their skills. The home side played down the slope in the first half and with less than five minutes on the clock their pack of forwards drove over the line for the opening try. The visitors hit back from the kick-off and having secured the ball in the Stocksbridge half, full-back Alex Murphy joined the line and danced passed three would be tacklers to score an excellent individual try to level the scores. With the forwards matching their opposition in the set pieces the Otliensians backs, orchestrated by fly-half Will Cooper, began to run the ball from all over the park. Long distance tries from Tobias Gill and Olly Eaves and a conversion from Conor Bateman stretched the visitors lead to 17-5 midway through the first half. 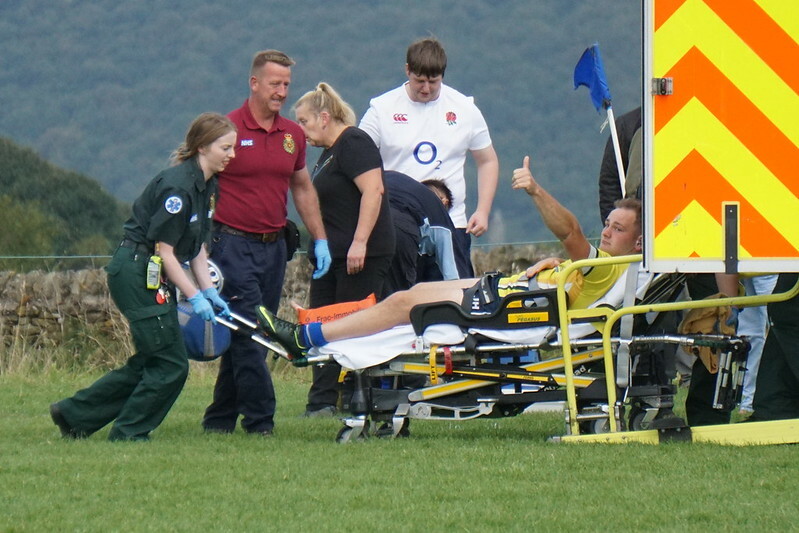 On twenty-five minutes a serious injury to wingman Josh Howarth held up the game for an hour and a half. The winger had broken his ankle and had to be taken to hospital by ambulance. The game was restarted with a scrum in the home 22. The ball was moved along the back line and from second phase possession Gill scored his second try from a planned backs move. The try was converted and also secured a bonus point for the visitors. With a half-time lead of 24-5 and having played up the slope Otliensians looked to be in a comfortable position. The second half started with the visitors immediately on the attack again and with the second half less than two minutes old Will Prest found a gap down the blind side to score in the corner. Bateman added a magnificent conversion from the touch-line to give the Otley club a commanding 31-5 lead. Olly Eaves then added his second of the match before Stocksbridge scored a consolation try on the stroke of full-time. However, Otliensians were not finished. From the kick-off the home team conceded a line-out in their 22 and with the last play of the match lock Matt Taylor drove over. The conversion was missed, nevertheless Otliensians had secured a resounding 41-12 victory. On debut, Joe Armitage, was outstanding at open side flanker. His tireless work on the ground and offensive tackling had the Stocksbridge forwards constantly on the back foot. The team has clearly worked hard during the summer and was well drilled in both attack and defence. Fly-half Will Cooper moved the ball at every opportunity and marshalled his back division like a seasoned veteran. If the team continues to maintain these standards then they can look forward to another successful season.